I interrupt your regularly scheduled "I'm two weeks behind in Thursday Book Questions" post to offer my quick reflection about the final Harry Potter book, which I recently reread in anticipation of Part 1 of the Deathly Hallows movie, to be officially released in theaters tomorrow (which means tonight for me). At midnight I'll be seeing it in IMAX, and I am beyond excited. So, without further ado, here is another Books I've Read post. Impressions: I have lost count of the number of times I have read this book. It may be around four or five times now. Naturally, I reread it this time in preparation for the HP7 Part 1 film release, because I wanted to have the full version of the story in the front part of my mind going into the movie extravaganza tonight. I read this over the course of about a week, when I traveled home to NY, then to California for a business trip for a few days, then back to NY again, at the end of October. It was perfect for the 6 hour flight to and from Cali. What struck me this time around was this book's ability to make me laugh out loud and yet burst into tears, all within the span of several pages, and then to cause this strange and beautiful phenomenon over and over again. It is brilliant in this respect. And the reasons why I laugh and cry are built upon the previous six volumes, and all I have grown to know and love about these characters and the challenge they are facing, together, as friends. 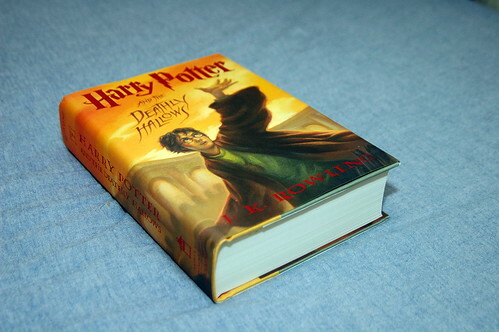 The third book, Prisoner of Azkaban, was my favorite of the series until the seventh volume; now Deathly Hallows occupies that position of honor in my life. An indication of just how much this is so: when I finished this reread of the book, after I closed the back cover, my fingers itched to flip the book over, open the front cover, and start the book over again. It was 2 am at that point. I almost did too. It is that good. As for this reread in relation to my expectations for the two-part film... Knowing where the films are split--Voldemort retrieving the Elder wand (sorry for anyone for whom that could be a spoiler)--it struck me as I read it this time that Part 1 of the movie has a lot of ground to cover. There are certain things I fully expect to be cut (Potterwatch comes to mind, alas), and I will find out if my guesses prove true or not in a few short hours. I rewatched the Half-Blood Prince movie two nights ago, and surprised myself by enjoying it far more this time around than I had when I saw it in theaters a year and a half ago at its midnight release. Upon reflection I realized the reason I enjoyed my viewing this time was because I stopped fighting the fact that I knew what was going on, and decided to embrace it instead. As soon as I let myself imbue the cinematic images and moments in the film with all that I know they mean in the fullness of the story (i.e., in the books), the moments in the movie meant so much more, which meant I fully entered into and enjoyed the story they told. So, I am going into the movie tonight with this newfound attitude of not expecting the movie to stand alone at all, but instead planning on letting my recent reread of Deathly Hallows inform everything I see and hear. I can't wait. Summed Up: This is a good, good book. Obviously, only read it after reading the previous six in the series. But books don't get much better than this one, to be perfectly frank. Image courtesy of Flickr user Joits courtesy of a CC license.